If you have tried putting together the new flat-pack furniture and were left with something barely resembling the furniture in the showroom and a hand-full of space parts and screws, you need the help of the professionals. We have been assembling wardrobes, beds, tables and other flat-pack furniture from IKEA and other retail shops, always delivering great looking furniture. Our furniture assembly Palmers Green N21 services are performed by knowledgeable professionals. Our years of experience guarantee you will receive high quality customer services without breaking the bank. Our assembly in Palmers Green N21 services offer a number of addition benefits you will enjoy, when making a booking with us. 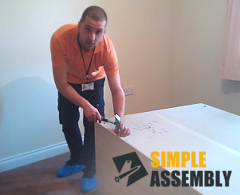 For quick and easy booking on Palmers Green N21 flat pack assembly services call 020 3404 5905 now! We have a team of friendly call centre operators expecting your call around the clock to help you define the right service for your needs and to offer you free quotes. And for those of you who'd rather get in touch and make bookings online, use our live chat or online booking form.